From an old town’s winding cobbled streets to grand royal palaces and cutting edge architecture; Copenhagen is certainly the coolest and chicest city to visit! With Denmark consisting mainly of islands and the peninsula of Jutland, it is hardly surprising that its gorgeous capital city is located over two of these; Zealand and Amager. Also known as Kongens village, the city is pleasingly crammed with street cafés, designer shops and some of the best restaurants in the world. Of course there are plenty of sites to gaze at, many of which we will spot on our included guided tour. Spot the Folketing (Danish Parliament) and the cathedral Vor Frue Kirke (Church of our Lady) and keep an eye out in the harbour for the famous sculpture of ‘The Little Mermaid’ from the fairy tale by Hans Christian Anderson. A break to Copenhagen would not be complete without a visit to Tivoli Gardens. Found right on the heart of the city, it is more than an amusement park. Founded in 1843 this national treasure contains historic buildings and lush gardens as well as its amusement park. Try out one of the nostalgic rides, including the wooden Roller Coaster from 1914 or discover beautiful flower settings along quaint paths while munching on some cotton candy or a candied apple. With entrance included during our stay there is something here for everyone. Just a short train ride from the centre of Copenhagen, this eco-friendly hotel is within walking distance of shops and restaurants and Sydhavn station. Facilities here include a restaurant, bar, small library, gym and summer terrace. Our single rooms are comfortable and feature air-conditioning, TV, iron, hairdryer and complimentary Wi-Fi. The transfer time from Copenhagen Airport to the hotel is approximately 15 minutes depending on traffic. 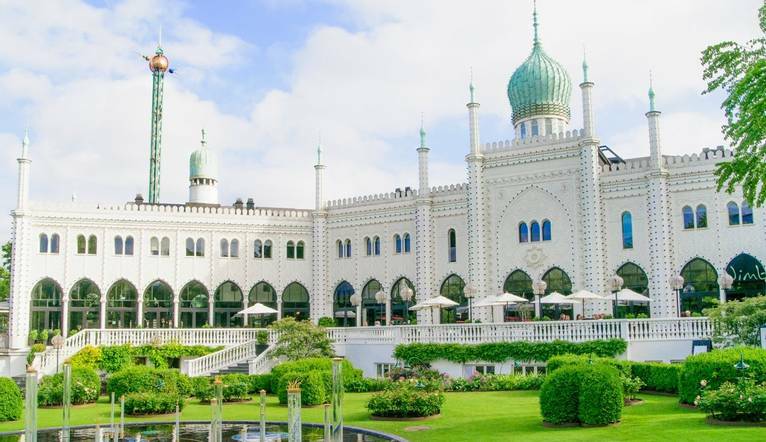 During your holiday, we have included a guided tour of the the city as well as entrance to the Famous Tivoli Gardens. Your Tour Leader will be on hand to offer advice or suggestions if required but gratuities are offered entirely at the sole discretion of the individual. We suggest a group collection to cover drivers, porters and hotel staff of €15.00. Your Tour Leader will collect this on your behalf and distribute it accordingly, thus relieving you of the burden of who, when and how much to tip. The tipping of housekeeping will be left to your individual discretion (a small amount left in your room on departure should cover this and would be much appreciated). As is customary, ‘the hat’ will be passed around for the driver and guide on all optional excursions. For any meals that are not included in your itinerary, or taxi fares, your Tour Leader can advise of an appropriate Ϻdd on.